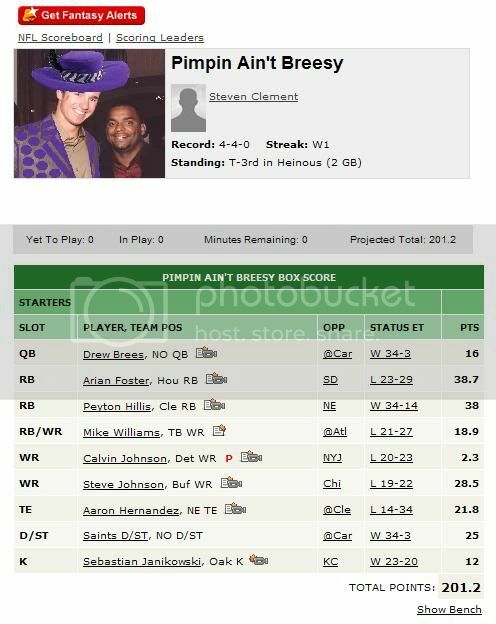 In an act of solidarity with my un-undefeated Bills, I just picked up and started their defense in all of my leagues. OK, this is partly because I have a hunch that someone (perhaps the ghost of Jairus Byrd) takes a Cutler pass back for six today. Really, you can’t go wrong starting any defense against Jay Cutler, ever. At least I hope not. They should just make the Bills play the Cowboys at the end of the season for fun. They did that for a couple years in a row in the 90’s and you know how that turned out! I rarely get the chance to brag when it comes to FF. With that said, I would like to nominate my ESPN team (which is more generous with points than the Yahoo league I’m in, but still) this week to the..
“Highest Points for Week 9 while Starting Calvin Johnson” contest. **this also makes the highest points for our league since it’s inception way back in 2009. ..and I remember I may not have responded before, but yeah, it doesn’t get much more pimp than Carlton Banks! Not too shabby. You’re the second person I’ve seen who had Hillis AND Foster this week. Not a bad combo!